Farewell, Sudan. We are sorry. Today we learned that Sudan had to be euthanized yesterday. 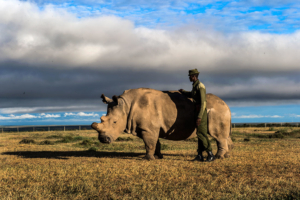 Sudan was the last male northern white rhino left on earth. Now there are only two left…his daughter and granddaughter. Sudan was captured as a youngster and taken to a zoo in Europe. In the early ’70’s, that probably saved his life. The last documented wild sightings of a northern white were in 2006. In 2009, Sudan was returned to Africa…Kenya this time. He lived out his life under 24/7 armed guard. His genetic material was harvested and there are hopes that a southern white rhino can be a surrogate for a northern white baby. Seven years ago, the western black rhino was declared extinct. Now there are only 2 northern whites. The Javan and Sumatran each have about 100 or less…and the fewer there are, the less genetic diversity which is critical to survival. Rest in peace, Sudan. We are sorry. And we will do everything we can to never let this happen again. Please join PARCA at Urban Axes in Philadelphia on Thursday 4/26 to Take Aim at Poaching! Our first axe-throwing event was so much fun and sold out in less than a week – so we are doing it again. You will be taught how to throw an axe and then you will compete for the title of best in your arena! PARCA and our sponsors will provide food, wine, and beer. We thank Sterling Pig Beer in Media PA for their generous donation! There will also be a 50/50 raffle and several raffle baskets available to win. Of course PARCA merchandise will be available for purchase. Come Take Aim at Poaching and help save a species!